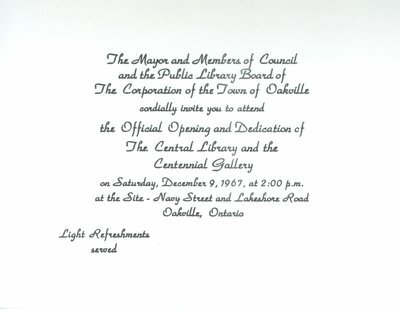 The official invitation sent out for the opening and dedication of the Central Library and Centennial Gallery. Includes a map and parking notice. In the event that you are unable to find parking in the Municipal parking lots, may we suggest that you leave this invitation on the dash of your automobile so that it may be seen from the street. For parking purposes our Police Department has agreed to honour this invitation on this occasion.